What was the challenge? We each had a color...Mine... Crushed Grape! Next, we could only use black or white to accent it! LOL! So here it is....Hope y'all like it or at least don't tell me! Hahahaha! Thanks Y'all!! See ya in a bit! Like it? I absolutely love it!!!!!!!! You my man are so amazing. Have a great time. Very cool. Are you having fun yet? I am sure you are probably already at CHA, and jumping up and down with tons of bags of goodies by now. Enjoy. Send more pics. I'm thinking self portrait here...and a super ultra fab color! Beyond Awesome Mr. Jim!! You did great! I saw this last night amoung the pics posted on Art From The Heart fb page and I even had to show my hubby yours....lol.... and if I show my hubby crafty pics, it's gotta be good! The crown you made is spectacular!! This would have pushed me way out of my box! I don't like purple. You did a great job with it. Love the dolls on the crown, the tags for wings. Very creative Jimbo! It's terrific!How you put together the crown is amazing and I love that face. Tried to tweet you when I saw Dyan's fb pictures but so far it"s Twitter - 1, Me - 0. Lol.Go enjoy the day. Jim, I dont think there is anything you can't conquer...it is a really neat purple, people, pleaser...sure wish i was in Anaheim to see all the amazing creations and products and most especially all the amazing designers. TFS, again. I know that is why it is called "challenge" but I think your submission is terrific. The parameters were difficult and yet you met the challenge in a big way. So much detail with just three colors. Great job! Ranger will not be disappointed. Wow - I love this Jim! The main image is great - it reminds me a little of The Beatles' Seargent Pepper Album and the late '60's / early '70's. Of course you won't remember back then as you're only young! LOL. I'm sure that Ranger will love your challenge piece too. I love it! Using your logo as the main image is just genius! And then the crown instead of the top hat is so fun! The phrase from Titanic, "I'm king of da world!" went through my head. Your background is fantastic.The border of black stars draws the eye right in on the center, but also helps move the eye around the whole piece. I'm amazed at how much detail you were able to build in using just white and black as accent colors. Fabulous...right down to the jaunty boutonniere! it works! I like it! I, too..love the star border! Fantastic!!!!! If you are giving it away you can send it my way - LOL!!! "You The Man , Jim ! " 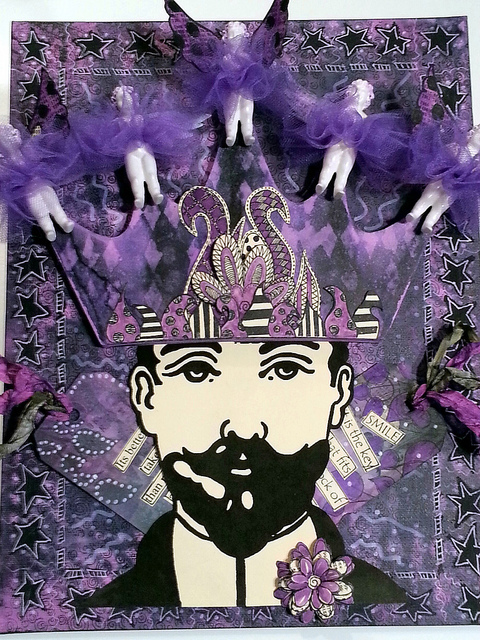 So very cool... love that purple... omg... got the Dylusional Tim Holtz "fabtabulous" thing goin' on . I think you did Ranger Proud ! You KNOW I love it!!!! I know everyone else will, too!! This is soooo freakin' cool!!!! hahahahahaha! I love your creation!!! I think you Rocked it!!! Have a fabulous time!! Jim, this is Absolutely Fabulous! Jim, what is there not to like. Wish I had one tenth of your talent. You are great! Jim, my favorite color is purple -- do you need my home address to send this to me? I mean, I want it to be as easy for you as possible! I feel Lent coming on -- hurry, excellent Fat Tuesday gift for your favorite purple loving fan! Unless your mom wants it, she's older than I am (I'm guessing) and if she really wants it, I guess you could send it to her.... Meanwhile, getting me everything in crushed grape! It has never looked so good as it does in your hands.